M.A.C.A.W. - Madison Area Cagebird Association of Wisconsin - Join Us! Welcome To The MACAW Library! Long Range Success in Amazon and Other Avian Husbandry. Borrowing a book from the MACAW Library is easy. Just contact our MACAW Librarian, Steve, to schedule a book pick-up at one of our member meetings. There currently is no set time limit to return your book, but we ask that you please return it within 30 days so other members may be able to borrow this book. During this time we hope that you enjoy your book selection and hope that you take advantage of other book selections in the future. Please, only MACAW members are eligible to take out books from the library. Becoming a member of MACAW is easy and still only $20 for a one year family membership. Interested in joining, please click here! 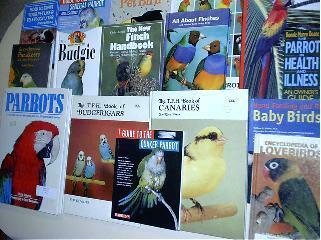 If you have a book that you would like to donate to our bird club, please bring it with you to our next monthly meeting. We will gladly accept it into our library and share it with our club members.